Like many married Jewish couples, Eric and I signed a ketubah during our wedding ceremony. Our intent was to hang it prominently on our wall immediately upon returning home from our wedding. To expedite the process, we bought a frame before the ceremony. Sadly, we opted to buy a cheap frame that didn't fit the irregular detentions of our ketubah instead of waiting a few extra weeks to have it professionally framed. (I can not emphasis enough how cheap this frame was, nor can I convey how completely awesome both Eric and I thought it was at the time, and how proud we were to have found such a great deal.) Needless to say, although we kept our hideous frame on our wall for several years, we never enjoyed seeing such an important document trapped in such an ugly encasement. When we moved aboard, we knew there was no way we were going to sacrifice the integrity of our beautiful teak walls for such a sad, ugly, plastic frame--no matter what it contained. So, years after we put pen to paper, we finally got our ketubah professionally framed. 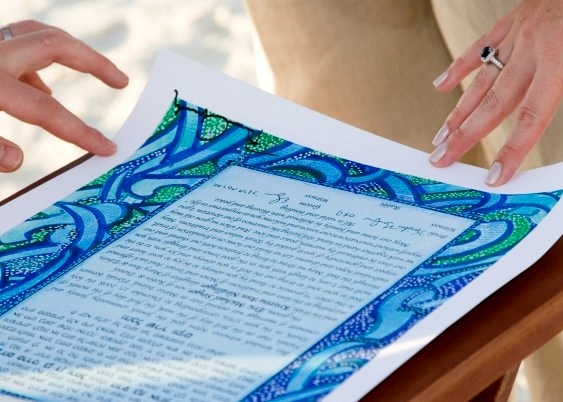 Years ago, when we selected our ketubah, I remember thinking the design reminded me of water, so I suppose it is only fitting that this beautiful piece of Judaica is now at home inside a sailboat.